One of the things I love about our Latino culture is that it is centered on the familia and food. For instance, Dia de los Muertos is about celebrating and remembering our loved ones that have passed. We build alters that contain objects that the departed treasured, including their favorite foods. The goals is not to have them return, but for us not to forget and to remember them in a positive way. 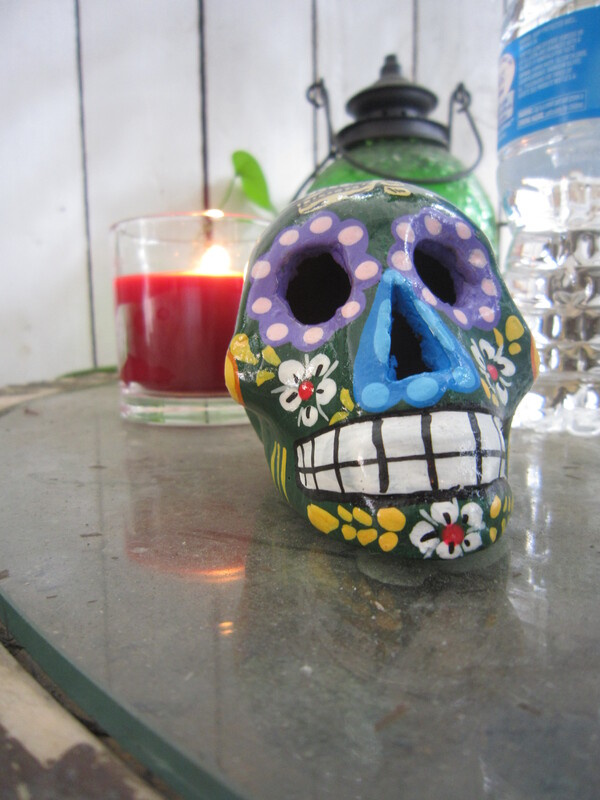 The Calaveras identify the dead in public, while our altars are specific and thoughtful. When I migrated to California, I was about 2 years old. Left behind were grandparents and their customs and stories. Therefore, I inherited Halloween instead of Dia de los Muertos. Although, I visited Mexico a few times as a child, I didn’t really know my grandparents find it hard, as I have tried to reclaim my ancestry, to connect with them. I find it hard to build alters for second hand stories and pictures. As a father, I struggle with how I am going to pass along culture to my children, while they will struggle with their modern world of tablets and smartphones. Even in Mexico, children seem to prefer an American Halloween to their time honored alters and Calaveras. When I grew up, Spanish was a private language, spoken only to familia. In public, we spoke English and did American things. Now, this private world has been embraced by the public and is celebrated. It is part of the American melting pot. Maybe it will be easier for my children to be bi-cultural. Or if we are lucky, they won’t even have to be hyphenated and will seamlessly flow into a new form of culture. My children are very young so I have some time. I think I will be able to work something out, especially if I start now. 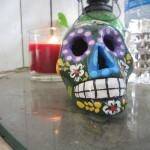 For instance, recently I got together with a few friends to celebrate a Dia de Los Muertos feast. We all had to bring our favorite dish. I made Papas con Carne. As a kid, I was a very picky eater, yet I never missed a meal of Papas con Carne. My Mom made it in a unique way that was simple, rustic and comforting. I was never able to find any place that made it like her. So I learned to make it myself. And like her, I used Mazola Corn Oil—which I learned helps accentuate the natural flavor in foods while having the added benefit of four times the amount of cholesterol-lowering nutrients than olive oil and 40 percent more than canola oil. I believe that food is culture. So part of my learning to make this dish is to be able to prepare it for my children, especially Jacob, who also seems to be a picky eater. Eventually, I hope to learn to cook all my favorite dishes from my childhood. I think every Dad should have a couple of recipes that he is known for, that only he can cook in a certain way, that his children look forward to eating on special occasions. 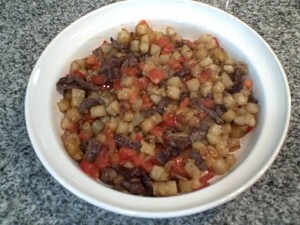 To that end, below is a video on how to cook my style of Mexican Papas con Carne. I hope that eventually, my children will prepare a bowl of Papas con Carne and place at the center of an alter they created for me. PS: Combine the leftovers with eggs in the morning to make an awesome breakfast burrito or fold a spoonful into a tortilla with a slice of avocado for a delicious taco. What are some of your favorite recipes? Do you have any suggestions for Quick Dad Meals? For more recipes using corn oil and special offers, visit Mazola’s Facebook page. This is part of a sponsored campaign with Latina Mom Bloggers and Mazola. However, all opinions expressed are my own.